The ability to coherently control the spatial degrees of freedom of matter waves is important for the emerging field of quantum engineering with applications in matter wave interferometry, quantum metrology, and quantum computation. For many purposes, quantum transport of trapped matter waves is performed via direct tunneling through the manipulation of the potential barriers that separate the different traps. This direct transport, however, is strongly dependent on the parameter values and gives rise to very sensitive Rabi-type oscillations of the populations of the localised states of the traps. A solution to this problem, allowing efficient transfer of population between distant traps, can be achieved using spatial adiabatic passage (SAP) processes. It consist of the adiabatic following of an energy eigenstate of the system that is spatially modified either in time or space. For these, transfer occurs with high fidelity regardless of the selected specific parameter values used to drive the system and their fluctuations. The aim of the symposium is to have (for the first time to our knowledge) a meeting dedicated purely to the idea of SAP and bring together the currently leading contributors from the theoretical and experimental side. 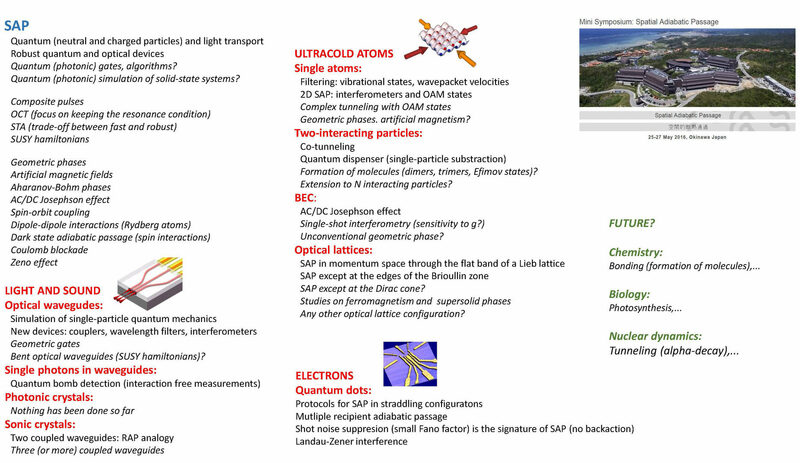 This will allow for fruitful discussions, not only across system boundaries (atoms, light and electrons), but also between different areas of application.